Fraudsters are cold-calling victims, falsely stating that they are calling from one of the well-known UK telecommunication service providers. They call victims claiming to provide a ‘Telephone Preference Service’ - an enhanced call-barring service, which includes barring international call centres. The fraudsters ask victims to confirm/provide their bank account details, informing them that there is a one-off charge for the service. Victims instead see monthly debits deducted from their accounts, which they have not authorised. The fraudsters often target elderly victims. In all instances, direct debits are set up without following proper procedure. The victim is not sent written confirmation of the direct debit instruction, which is supposed to be sent within three days. On occasions when victims attempted to call back, the telephone number provided by the fraudster was either unable to be reached or the victim’s direct debit cancellation request was refused. During 2017, there were 493 Action Fraud Reports relating to this fraud. There is only one Telephone Preference Service (TPS). The TPS is the only official UK 'do-not-call' register for opting out of live telesales calls. It is FREE to sign-up to the register. TPS never charge for registration. You can register for this service at http://www.tpsonline.org.uk. You will receive postal confirmation of genuine direct debits. If you notice unauthorised payments leaving your account, you should contact your bank promptly. Always be wary of providing personal information, or confirming that personal information the caller already claims to hold is correct. Always be certain that you know who you talking to. If in doubt hang up immediately. 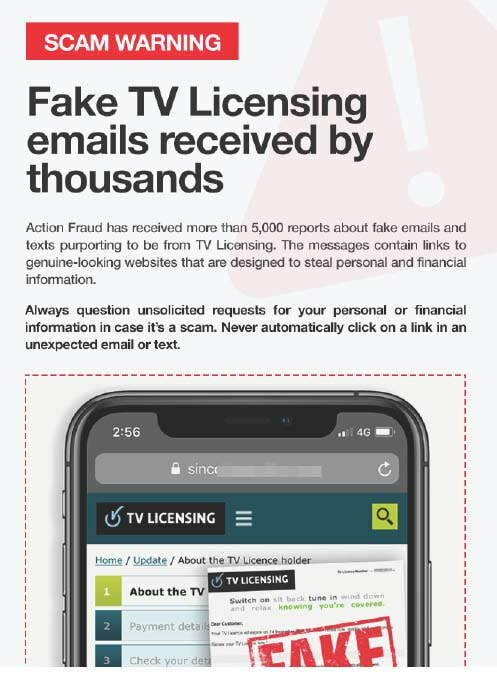 If you have been affected by this, or any other type of fraud, report it to Action Fraud by visiting www.actionfraud.police.uk or by calling 0300 123 2040. We are currently investigating an incident whereby an elderly female has been a victim of a phone scam.The lady received a phone call from 0345 788 8444 and the caller told the victim he was a member of the NatWest Fraud Team. He even verified some of her bank details, gaining her trust so that she would disclose her pin number. Subsequently £38,000 was stolen from her account. On this occasion, the person sounded very genuine. Please be vigilant. Banks will NEVER ask for pin numbers over the telephone, so don't give out this information. If you have any doubts, terminate the call and seek advice. Over the past three days there have been six reported scam attempts in the Sherborne area, all using the same tactic. The bogus caller pretends to be a police officer who informs the recipient of the call that either they have someone under arrest with a cloned bank card, and they need the resident's bank card details as evidence, or that the bogus 'police officer' is investigating a fraud at the person's bank and they require them to withdraw £6000 and hand the notes over to a police officer outside the bank. They are told that the cashier is in on the scam and will give the resident fake notes which is why the 'police officer' will be outside to collect them. Telephone scams are on the increase, may I ask that you make all your residents/community contacts aware please? Fraudsters are attempting to entice victims who are looking for cheap flights abroad. Victims have reported booking tickets via websites or a “popular” ticket broker, only to discover that after payment via bank transfer or electronic wire transfer, the tickets/booking references received are counterfeit. In some cases, all communications between the company or broker and the victim have been severed. Fraudsters are targeting individuals who are seeking to travel to African nations and the Middle East, particularly those wishing to travel in time for popular public and religious holidays. Pay safe: Be cautious if you're asked to pay directly into a private individual’s bank account. Paying by direct bank transfer is like paying by cash – the money is very difficult to trace and is not refundable. Wherever possible, pay by credit card or a debit card. Conduct research on any company you’re considering purchasing tickets from; for example, are there any negative reviews or forum posts by previous customers online? Don’t just rely on one review - do a thorough online search to check the company’s credentials. Check any company website thoroughly; does it look professional? Are there any spelling mistakes or irregularities? There should be a valid landline phone number and a full postal address so that the company can be contacted. Avoid using the site if there is only a PO Box address and mobile phone number, as it could be difficult to get in touch after you buy tickets. PO Box addresses and mobile phone numbers are easy to change and difficult to trace. Be aware that purchasing tickets from a third party, particularly when initial contact has been made via a social media platform can be incredibly risky. If tickets to your intended destination appear cheaper than any other vendor, always consider this; if it looks too good to be true, it probably is! Look for the logo: Check whether the company is a member of a recognised trade body such as ABTA or ATOL. You can verify membership of ABTA online, at www.abta.com. 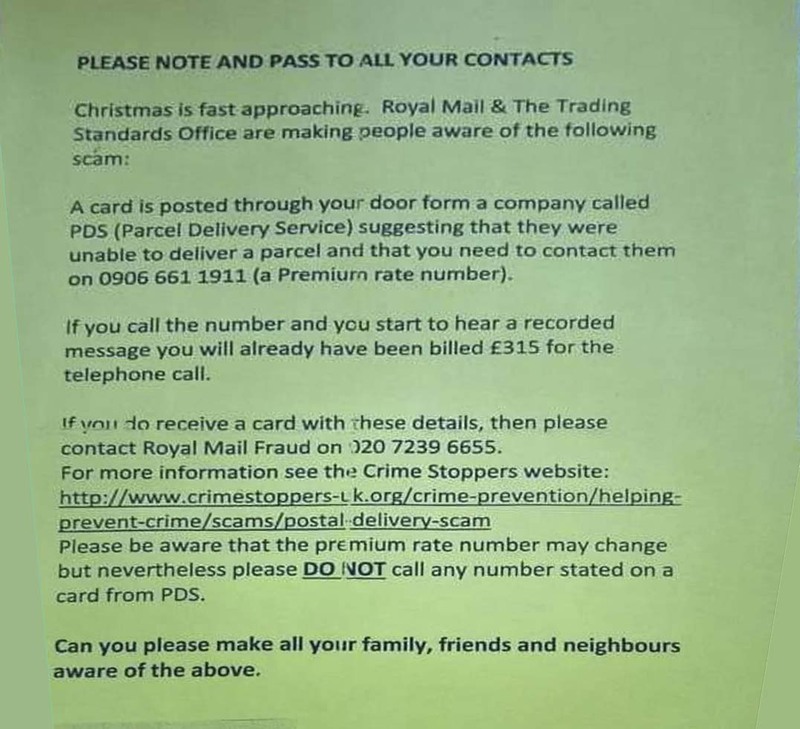 If you have been affected by this, or any other type of fraud, report it to Action Fraud by calling 0300 123 2040, or visiting www.actionfraud.police.uk. Action Fraud has recently experienced an increase in the number of calls to members of the public by fraudsters requesting payments for a “phantom” debt. The fraud involves being cold-called by someone purporting to be a debt collector, bailiff or other type of enforcement agent. The fraudster may claim to be working under instruction of a court, business or other body and suggest they are recovering funds for a non-existent debt. The fraudsters are requesting payment, sometimes by bank transfer and if refused, they threaten to visit homes or workplaces in order to recover the supposed debt that is owed. In some cases, the victim is also threatened with arrest. From the reports Action Fraud has received, this type of fraud is presently occurring throughout the UK. Make vigorous checks if you ever get a cold call. Bailiffs for example, should always be able to provide you with a case number and warrant number, along with their name and the court they are calling from; make a note of all details provided to you. If you receive a visit from a bailiff, they must always identify themselves as a Court Bailiff at the earliest possible opportunity. Ask to see their identity card which they must carry to prove who they are, this card shows their photograph and identity number. They will also carry the physical warrant showing the debt and endorsed with a court seal. If you work for a business and receive a call or visit, be sure to speak with your manager or business owner first. Never pay the debts yourself on behalf of the business you work for; some fraudsters have suggested employees make payment suggesting they can then be reimbursed by their employer when in reality the debt is non-existent. Exercise caution believing someone is genuine because you’ve found something on the internet; fraudsters could easily create fake online profiles to make you believe them. Double check with the court, company or public body they claim to work for to confirm whether the call is legitimate; if you use a landline make sure you hear the dialling tone prior to dialling as the caller could still be on the line and you could potentially speak to the fraudster(s) to confirm the non-existent debt. Also be sure to independently search for a telephone number to call; never use a number provided by the caller without carrying out your own research. If you know you have a debt, keep in regular contact with your creditor and be sure to establish the debt type at the earliest opportunity if you are not aware. This will help you to understand who might be in contact with you regarding any repayments or arrears. You can report suspicious calls like these to Action Fraud by visiting www.actionfaud.police.uk or by calling 0300 123 2040. Scam warning - Residents are being asked to pay tax due to HM Revenue and Customs (HMRC) in iTunes vouchers. Dorset Police has been made aware of a scam whereby individuals are being contacted, in a variety of methods, and told they owe an outstanding debt to HMRC. In one day, 13 reports were made to Dorset Police from residents, primarily in the North and East of the county. Detective Inspector Neil Wright, Force Volume Crime Unit, said: "I urge residents to be aware of this trend affecting Dorset. Tell your loved ones, your neighbours and your colleagues. "This is a scam. HMRC will never ask you for iTunes vouchers or anything else similar as payment for unpaid tax. "If you receive a suspicious call just hang up. Don't engage with these people as it just gives them more opportunities to pull you in." iTunes gift cards are becoming more popular as a way to collect money from victims because they are easy to redeem and quick to sell on. You do not need to be in possession of the physical card to redeem the value. Often victims are asked to read out the serial code on the back over the phone which instantly credits their account. A HMRC spokesperson said: “HMRC takes security extremely seriously. We are aware that some people have received telephone calls from individuals claiming to be from HMRC. We have a well-known brand, which criminals abuse, to add credibility to their scams. If you are suspicious of an email or text claiming to be from HMRC, please send it to phishing@hmrc.gsi.gov.uk so it can be checked. For information and advice about scams in Dorset, go to the Fraud Alert page of our website - dorset.police.uk/fraud. Scams should be reported to Action Fraud (the national fraud and cyber crime reporting centre) on 0300 123 2040. Alternatively you can sign up to Action Fraud Alert to receive direct, verified and accurate information about scams and fraud in your area by email, recorded voice and text message. Fraudsters are emailing members of the public who are expecting to make a payment for property repairs. The fraudsters will purport to be a tradesman who has recently completed work at the property and use a similar email address to that of the genuine tradesman. They will ask for funds to be transferred via bank transfer. Once payment is made the victims of the scam soon realise they have been deceived when the genuine tradesman requests payment for their services. Always check the email address is exactly the same as previous correspondence with the genuine contact. For any request of payment via email verify the validity of the request with a phone call to the person who carried out the work. Check the email for spelling and grammar as these signs can indicate that the email is not genuine. Payments via bank transfer offer no financial protection; consider using alternative methods such as a credit card or PayPal which offer protection and an avenue for recompense. http://www.actionfraud.police.uk/report_fraud or by telephone 0300 123 2040. People selling their items on online platforms are falling victim to a new type of advance fee fraud. This involves a fraudster, posing as a buyer, sending an email to the seller (victim), agreeing to the full asking price of the item. They state that they are unable to collect the item themselves and will arrange for a courier to pick it up instead. The fraudster then sends a fake payment confirmation email from a different email address, one which falsely purports to be from a payment platform. In the course of the email exchange, the seller/victim is requested to pay the courier fee. Once the payment is made the contact is broken, the item is not picked up and the money paid for the ‘courier’ is gone. Be wary when buyers wish to purchase items at the full asking price without viewing them. Avoid paying an advanced fee if you are a seller; should you choose to use a courier, arrange your own. Check feedback online by searching the associated phone numbers or email addresses of the seller/buyer. Feedback will give you useful information about recent transactions other buyers/sellers have made. If you, or anyone you know, have been affected by this fraud or any other scam, report it to Action Fraud by calling 0300 123 2040 or visiting www.actionfraud.police.uk. Fraudsters are targeting members of the public who are expecting to make a payment for property repairs. The fraudsters, via email, will purport to be a tradesman who has recently completed work at the property and use a similar email address to that of the genuine tradesman. They will ask for funds to be transferred via bank transfer and once payment is made the victims of the fraud soon realise they have been deceived when the genuine tradesman requests payment for their services. Payments via bank transfer offer no financial protection; consider using alternative methods such as a credit card or PayPal which offer some protection and avenue for recompense. If you believe that you have been a victim of fraud you can report it online at: http://www.actionfraud.police.uk/report_fraud or by telephone on: 0300 123 2040. - Make sure you ask for identification. You DO NOT have to let them in and they MUST leave if you tell them to. - If you are suspicious of someone's ID card, never ring the number on the card. Tell them to wait outside, shut the door and ring the genuine number from the telephone book or website. - If you are interested in what a door-to-door salesman is offering, do not agree to buy anything there and then. Take time to find out about their business. Get two or three quotes from different businesses. - Contact trading standards or call the Police on 101 if you are unsure about a trader that comes to your door. Action Fraud has received several reports in the last 24 hours from businesses who have been sent online extortion demands from scammers threatening a cyber attack. The scammers, who call themselves the “RepKiller Team”, have been sending emails to businesses across the UK demanding payment of between £300-£500 in Bitcoins by a certain date and time. If the demands are not met, the team have threatened to launch a cyber attack against the businesses and their reputation by automating hundreds of negative reviews online. The emails also claim that once actions have started, they cannot be undone. 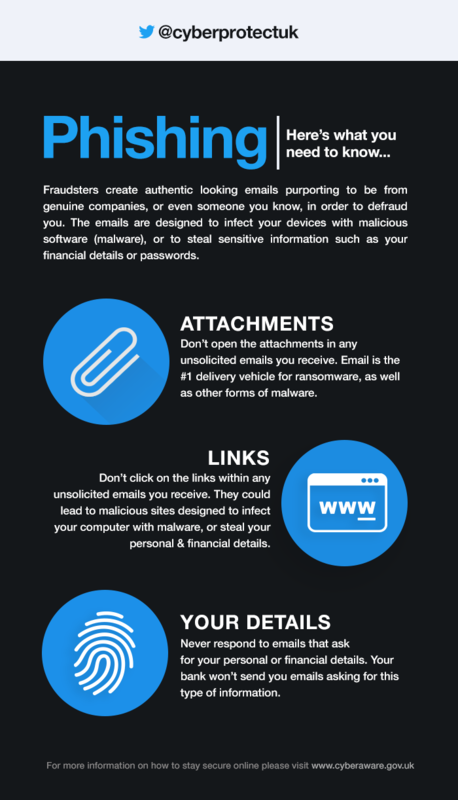 Although these scammers are currently calling themselves “RepKiller”, it is common for fraudsters to continually change and adopt new tactics – email names can be made and changed easily. What to do if you receive one of these emails? Do not pay the demand. There is no guarantee the scammers won’t launch an attack and could encourage further extortion demands in the future. Retain all the original emails. Should law enforcement investigate, the information contained within the email headers can be used as evidence. Fraudsters are sending out virus infected emails that claim a package has been seized by HM Revenue & Customs upon arrival into the United Kingdom. The official looking scam emails claiming to be from Royal Mail contain a link to a document which will install malicious software on your computer designed to steal credentials like account names, email addresses and passwords. Royal Mail is sorry to inform you that a package addressed to you was seized by HM Revenue & Customs upon arrival into the United Kingdom. A close inspection deemed your items as counterfeit and the manufacturers have been notified. If your items are declared genuine then they will be returned back to you with the appropriate custom charges. You may have been a victim of counterfeit merchandise and the RM Group UK will notify you on how to get your money back. Please review the attached PDF document for more information. To help the spread of the virus, the email also says: “you will need to have access to a computer to download and open the Zip file”. If you receive one of these emails, do not click on any links or download any attachments and report it to Action Fraud. 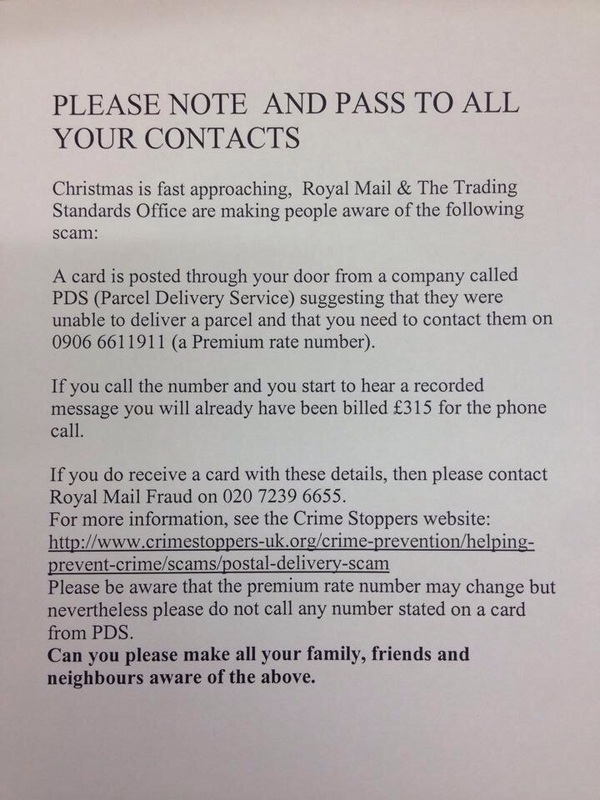 Royal Mail will never send an email asking for credit card numbers or other personal or confidential information. Royal Mail will never ask customers to enter information on a page that isn’t part of the Royal Mail website. Royal Mail will never include attachments unless the email was solicited by a customer e.g. customer has contacted Royal Mail with an enquiry or has signed up for updates from Royal Mail. Royal Mail have also stressed that they do not receive a person’s email address as part of any home shopping experience. There is email in circulation that appears to have been sent from a legitimate Lancashire Constabulary email address. The email appears to come from ‘Lyn Whitehead’ and is asking the recipient to pay an invoice that is attached to the email. The email has not been generated from inside the Constabulary or by the Constabulary. This email has not been sent from Lancashire Constabulary. A third party supplier to the Constabulary has had their data breached, as a result of the breach this Lancashire Constabulary email address has been spoofed and used to generate spam to recipients far and wide. This type of email is commonly referred to as spam, and if you have received it you MUST NOT open it. Instead delete it from your email system to avoid infecting your device. If you have opened the attachment and ‘enabled macros’ it is very likely that all your personal data will have been breached. You MUST change all your passwords for personal accounts, including your bank accounts. If you believe you have become a victim of this get your device checked over by a professional. If you do make a report please provide as much detail as you can about the email and any effects it has had on your computer. Additionally if your Anti-Virus software detects any issues in relation to this email please provide us with the details. The National Fraud Intelligence Bureau (NFIB) has been alerted to a pension scam whereby cold callers continue to target members of the public aged 50 to 60 years old to release and transfer their pension early. Suspected firms who advertise and arrange pensions are offering investments in alternative commodities such as hotel developments or property in Cape Verde, and operate as unregulated collective investment schemes. Often, the cold calling ‘pension companies’ involved are neither regulated nor qualified to give financial advice and classify themselves as a ‘trustee’, ‘consultant’ or an ‘independent advisor’ and offer exceptionally high return rates for investors. Some victims have signed documents that authorises a limited company to be set up using their personal details, including utilising a Small Self–Administered Scheme (SSAS). Whilst SSAS accounts and limited companies are essential for legitimate schemes, the fact that victims are unaware that this will happen suggests that the scheme may not have been fully explained to them, increasing the likelihood that there may be an element of fraud involved. Fraudsters have been phoning victims telling them that they have been placed in the wrong council tax bracket for a number of years and are entitled to a rebate. They normally say that this rebate should be worth about £7,000. Once the victim is convinced, the fraudster tells them that in order to receive the rebate they will need to pay an administration fee in advance. The payment they ask for varies between £60–£350. The victim provides the details and makes the payment, but then is no longer able to make contact with the person they spoke to on the phone. When they phone their council about the rebate and the fact that they are in the wrong tax bracket, the council will confirm that they know nothing about it and that they have been contacted by fraudsters. The fraudsters have mainly been targeting both male and female victims who are aged 60 and over and live in the Sussex area, but it is likely that the fraudsters will also start to target victims in other areas. Never respond to unsolicited phone calls. Your local council won’t ever phone out-of-the-blue to discuss a council tax rebate. If you receive a call of this nature, put the phone down straight away. No legitimate organisation will ask you to pay an advanced fee in order to receive money, so never give them your card details. If you think you have been a victim of fraud, hang up the phone and wait five minutes to clear the line as fraudsters sometimes keep the line open. Then call your bank or card issuer to report the fraud. Where it is possible use a different phone line to make the phone call. ​Members of the public or businesses across Dorset may have received calls from withheld numbers – with the caller claiming to be phoning from Dorset Police offering advertising in Dorset Police magazines and publications. Dorset Police very rarely calls local businesses to discuss advertising opportunities, but when they do they will provide the caller with a name, contact telephone number and a collar number. Dorset Police will never call local businesses or members of the public demanding money for advertising. On the rare occasions that businesses advertise with Dorset Police, they will always receive an official invoice.